Sun City Shadow Hills is an amazing California 55+ community with fabulous amenities and architecture. Enjoying a rewarding active adult lifestyle in a luxurious setting is a dream come true for many retirees. Fortunately, there are plenty of luxurious active adult communities to choose from offering fabulous amenities and beautiful homes in ideal retirement destinations. While luxury living can mean different things to different people, most can agree that high-end amenities like resort-style swimming pools and state-of-the-art fitness centers, championship golf courses and clubhouse restaurants, all create a luxurious ambiance for retirees to enjoy a true luxury lifestyle. This year's list of 20 Luxurious Active Adult Communities, listed in no particular order, represent some of the most impressive communities in the country. The team at 55Places selected these communities based on personal visits to tour the amenity facilities, see the homes and witness first hand luxury active adult living at its finest. Read on to discover your dream community for a fabulous luxury lifestyle. Sun City Shadow Hills – Indio, CA Sun City Shadow Hills impresses residents with impeccable architecture and a stunning setting in the gorgeous Palm Springs area. This picturesque Del Webb community offers two beautiful clubhouses giving residents every amenity imaginable. The Montecito Clubhouse boasts 35,000 square feet inclusive of indoor and outdoor swimming pools, state-of-the-art fitness facilities, studios for ceramics, arts and crafts, a billiards hall, library, card room and more. The Santa Rosa Clubhouse offers another 14,000 square feet featuring a second fitness center, indoor swimming pool, indoor walking track and more. This amazing 55+ community is planned for 3,400 homes surrounded by meticulous landscaping and dazzling views. Residents also enjoy 36 holes of golf, tennis courts, bocce ball courts, landscaped trails and lovely parks. 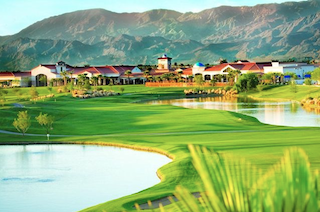 Sun City Shadow Hills is a luxurious dream come true for retirees in Southern California. Trilogy at the Vineyards - Brentwood, CA Located among picturesque vineyards in the stunning California countryside is Trilogy at the Vineyards. This Shea Homes community is planned for 1,100 homes and pampers residents with exceptional amenities in the spectacular 34,000 square-foot Club Los Meganos. Residents enjoy a comprehensive collection of world-class amenities including a beautiful outdoor swimming pool and cabana, the Sawa Day Spa, a state-of-the-art fitness center, demonstration kitchen, indoor swimming pool, terraced tea gardens and four delectable options for on-site dining. Adjacent to Trilogy is the Brentwood Golf Club offering 27 holes of championship golf, where Trilogy residents enjoy preferred pricing and access. Unique architecture and exquisite décor enhance the luxury active adult lifestyle at this gorgeous Northern California 55+ community. PebbleCreek – Goodyear, AZ PebbleCreek is a sprawling resort-style community by Robson planned for 6,200 homes for residents as young as age 40. The enviable collection of high-end amenities and ideal location in the Phoenix valley has made PebbleCreek a highly sought after community among luxury loving active adults. Multiple clubhouses offer countless amenities with special features including two creative arts centers offering spaces for woodworking, painting and ceramics as well as an on-site gallery space and stage theater. Additional highlights include 36 holes of golf, 12 tennis courts, state-of-the-art fitness facilities, four sparkling swimming pools, delicious on-site restaurants and much more. The lavishly appointed clubhouses of PebbleCreek create the ultimate in Arizona luxury living. Sun City Festival in Arizona impresses residents with countless amenities and a rewarding social lifestyle. Sun City Festival – Buckeye, AZ At the base of the White Tank Mountains, Sun City Festival emerges as one of the area’s finest active adult communities. With plans for 7,200 homes, this Del Webb masterpiece offers a phenomenal collection of amenities for residents aged 45 or better. The main clubhouse features 31,000 square feet of impressive amenities including a spectacular resort-style outdoor swimming pool, a state-of-the-art fitness center and delicious on-site dining options. Residents can expand their education at the Lifelong Learning Academy offering a comprehensive curriculum. Outdoor features include a softball stadium, amphitheater and numerous sports courts in addition to an 18-hole championship golf course. Every aspect of life at the luxurious Sun City Festival is cherished by its lively residents. Trilogy at Encanterra – Queen Creek, AZ Trilogy at Encanterra by Shea Homes is a gated 55+ community boasting the ultimate in luxury resort-style living. Immaculate architecture, design and furnishings grace every inch of the 60,000 square-foot La Casa Clubhouse. Here residents enjoy opulent amenities and unsurpassed concierge service. Features include a state-of-the-art fitness center, 2 outdoor swimming pools, an indoor swimming pool, hobby and game rooms, billiards and fabulous dining at four wonderful on-site restaurants. The Alvea Spa is a popular amenity offering a full-service menu for pampering and relaxation, a welcome treat after a day on the 18-hole championship golf course. 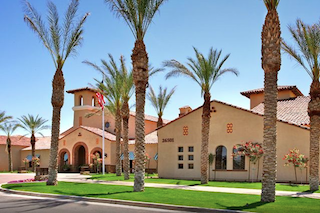 The combination of exquisite amenities and attractive homes have made this Trilogy community a favorite luxury living destination for discerning retirees in the Phoenix East Valley area. Del Webb Naples – Ave Maria, FL Located within the master planned community of Ave Maria is the magnificent Del Webb Naples. Here residents enjoy access to the private Club Campus facility of 36,000 square feet in addition to all the extra bells and whistles of the Ave Maria town center. Wonderful conveniences are minutes from home including a grocery store, coffee shop, salon, florist, church, restaurants, boutique shops and more. Two additional clubhouses offer state-of-the-art fitness centers. The Ave Maria water park features resort-style swimming and additional parks offer various sports courts, an outdoor amphitheater and pet park. Residents also receive discounted green fees to the 18-hole Golf Club, a challenging course complete with a fantastic practice facility including an aqua driving range. The abundance of world-class amenities have made Del Webb Naples a highly sought-after destination for luxury seeking active adults. 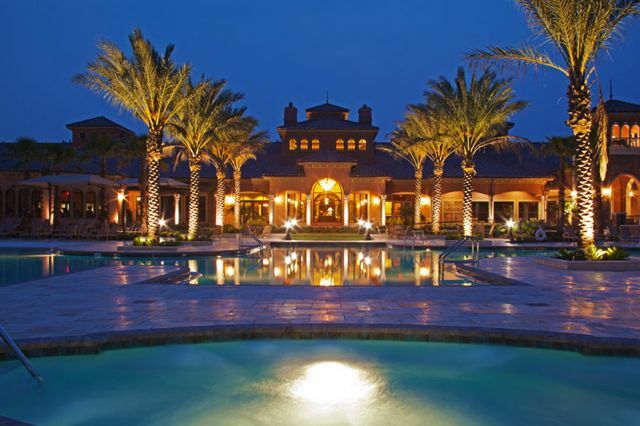 Del Webb Ponte Vedra is sought after by Florida retirees for its elegant design and world-class amenities.